Without doubt the biggest blackcurrant we have ever seen, and really sweet too! Bigger than a penny piece! Good garden performance too, with mildew resistance and good vigour in pots or soil. Sweet enough to eat straight from the bush, as well as great for smoothies and fruit salads. Simply the largest Blackcurrant we have ever seen - end of. 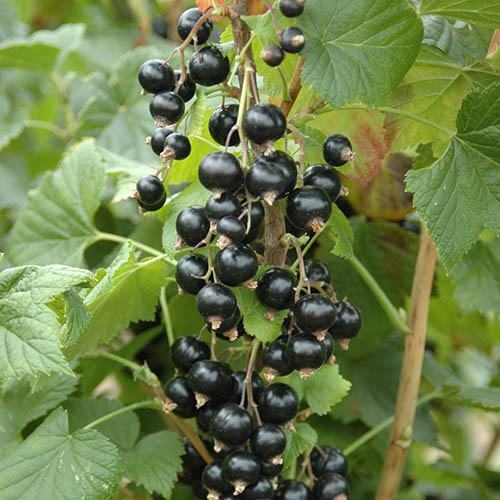 If you like your fruits big and juicy, this is the currant for you. And they are particualrly sweet tasting too straight form the bush. This new variety packs a punch too in yield - with more and bigger fruit, expect to pick crops up to 4Kg (8 lbs) of fruit once mature. And, it is also very mildew and disease ressitance, so makes a great garden variety, and deservedly has just won the RHS Award of Garden Merit. Big Ben - the perfect blackcurrant all-rounder. Supplied as a Uk grown Bush, minimum 3 breanches, trimemd to 15-20cm tall, to plant straight out.